Numerous forage testing laboratories evaluate forages, byproduct feeds and total mixed rations for neutral detergent fiber digestibility (NDFD). Evaluation of forages and other feedstuffs for NDFD is being conducted to aid prediction of feed energy content and animal performance. Research has demonstrated that lactating dairy cows will eat more dry matter (DM) and produce more milk when fed forages or total mixed rations with optimum NDFD. Understanding NDFD results from the laboratory is important. Laboratories have conducted sufficient evaluations of NDFD on forage, byproduct feeds and total mixed rations and general databases are available to help producers and nutrition consultants benchmark individual sample results. This Focus on Forage will highlight a simple NDFD database to aid producers and nutrition consultants in understanding laboratory NDFD values for forage, byproduct feeds and total mixed rations. How was the NDFD database developed? 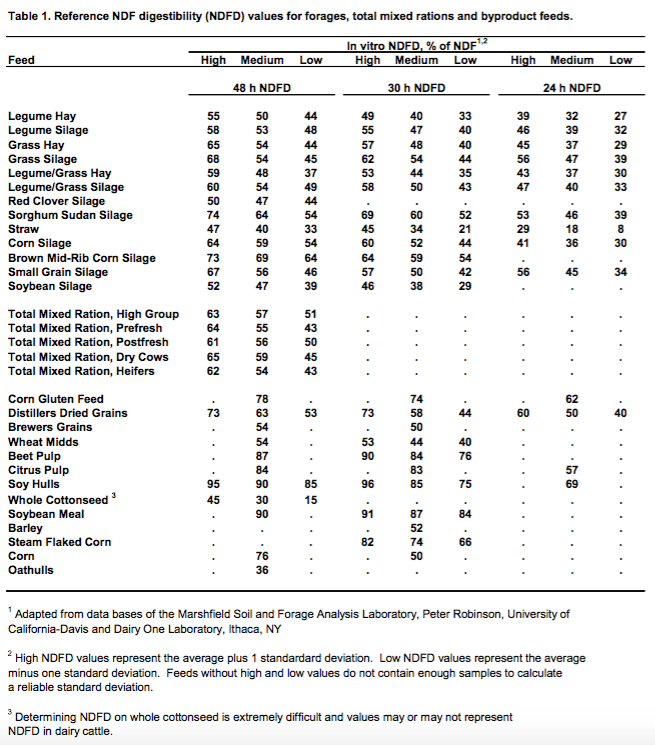 The NDFD of common forages, byproduct feeds and total mixed rations are presented in Table 1. The NDFD database was developed from databases available at the Marshfield Soil and Forage Analysis Laboratory, University of California-Davis (Dr. Peter Robinson personal communication) and Dairy One Laboratories in Ithaca, NY. The high and low values for NDF digestibility are not listed for forage or other feeds if sufficient sample numbers were not available. How are database NDFD values used? Because most producers and feed consultants now evaluate forages and other feeds for NDFD, a simple set of benchmarks is useful. For example, if a dairy producer receives a laboratory evaluation that the 48 hr in vitro NDFD of legume silage is 40.0 % of NDF what does this mean? Using Table 1, producers and nutrition consultants can quickly reference their NDFD value to similar materials. For example a 48 hr in vitro NDFD for legume silage of 40.0 % is low as identified by Table 1. The information in Table 1 can also be used to identify forages and feeds that are high in NDFD should such feeds be needed in animal diets to improve NDFD of the total diet. Finally, Table 1 provides 48, 30 and 24 h in vitro NDFD values to aid cross-referencing NDFD when determined by different in vitro incubation time points. Estimating Alfalfa RFV in the Field Using PEAQ Step 1: Choose a representative 2-square-foot area in the field. Step 2: Determine the most mature stem in the 2-square-foot sampling area using the criteria shown in the table to the right. Step 3: Measure the length of the tallest stem in the 2-square-foot area. Measure if from the soil surface (next to plant crown) to the tip of the stem (NOT to the tip of the highest leaf blade). Straighten the stem for an accurate measure of its length.